C.C. and Mia are the two cats we currently own. We adopted them the first week of school in 2012. C.C. – the black and white one – is fluffiest, the more patient of the two, but tends to keep to herself. Mia is the more social of the two, by far. Though she will not hesitate to express her disapproval, she has a relevance and yearning for human companionship that reminds me of the dogs I have known. She is very responsive to voice requests, and she always puts herself in the middle of whatever the family is doing. If we say, “Mia! I’m going to beat you up the stairs!” She immediately runs over to the bottom of the stairs and waits for you to start running. As soon as you start, she rockets to the top of the stairs, looks back at you and meows. Not kidding. It happens just about every day. C.C. by contrast will usually be somewhere off by herself. The two of them get along well, play and run through the house together and keep each other company. Zoe. Zoe was a white Cat with one green one blue eye, adopted as a kitten by my mother in law. Prince Frederick. This cat’s story begins in a garbage dump. My sister and I were standing on the back of a 1953 Chevy flatbed pickup that everyone referred to as “Old Barney.” Heaving and hurling heavy black garbage bags into the county dump. There was an unspoken contest that vaguely related to distance and the occasional bonus of a spectacular bag rupture. We noticed a tiny emaciated orange and white kitten – it looked to be a couple weeks old – with big bloody teeth marks on the back of its neck. Its mama and siblings were no where to be seen. The size of the teethmarks indicated the poor thing had been attacked by a dog – or was being raised by a bobcat with anger management issues. We begged our dad to let us take it to the vet. We were way to wise to ask if we could keep it. Timing was everything. Twenty minutes later the vet was telling us that the kitten was closer to 3 months old and was malnourished and had ear mites. He cleaned the neck wounds, shaved away the fur around the area, and gave us some salve for the wounds and something else for the ear mites. Like many of the biggest decisions in this world, the decision to keep the kitten happened indiscernibly. There is a phase where everyone believes no decision has been made. Suddenly everyone realizes the deal is done. Few understand when where or how. The kitten became ours at an imperceptible point somewhere between the time the vet handed my dad the medications, and the moment my sister and I began a casual discussion of what we would name the cat. What we would like to name a cat like this, not – mind you – what we will name our cat. I think my sister actually did the genius move of surmising aloud what kind of name the kitten would like. Looking back on this I have to wonder at our choice of words, and conclude that my sister and I on some level, had the intuition that the cooperation of key stakeholders is best maintained by preserving the comforting appearance that this is all still just tentative. Even though we are long past the point of no return. As we got back into Old Barney, now with the kitten, someone wanted to name the cat Princey, someone wanted to name him Fredrick. A half mile down the road we settled on the grand solution of “Prince Frederick” which offered the flexibility that would later allow some to call him “Princey,” some to call him “Freddy” and my Dad to call him “cat”. Imagine my Mom’s surprise when my sister burst through the front door with the announcement “Mom we’ve adopted a kitten!”. Imagine also, the surprise of our 3 dogs. Two of the dogs, Blondie and Butterscotch, quickly – at the point of needle sharp little claws learned to leave the kitten alone. Our other dog Midnight, however, believed with all her little doggy heart that that this little scrawny kitten was the puppy she’d always wished for. She followed him around, cleaned him – yes, the way a mother dog cleans her pups – licked his ears and so forth. We could always tell when Midnight had “bathed” Princey: he looked like a not-so-happy little boy, all Brylcreemed up for school pictures. He tolerated this and the dog and cat learned to play together and get along well. Princey grew up into a fine old tomcat and lived a good 17 years or so. Butterball lived with a little gray poodle named Andre on a retired dairy farm in Waterville Maine, owned by my Uncle Victor and Aunt Ruth. Andre lived in constant deference to Butterball, a huge yellow tomcat who was 11 years old and almost twice the size of the poodle, when I was there as a kid. Butterball lived off the mice around the farm and we saw him with a fresh catch nearly every day. Several times he caught a mouse in the middle of the night. Whenever this happened we all knew it because – for some reason – he insisted on dropping the mouse in the moonlit grass directly under Uncle Victor and Aunt Ruth’s bedroom window up on the 2nd floor. Standing over the mouse, Butterball would commence meowing and making a ruckus until Uncle Victor would open his bedroom window and call down in a sleepy gruff voice his approval to Butterball: “Yes, that’s a good mouse, Butterball!” Then and only then, the big cat would stop all the noise and get down to the business of eating his late night dinner. The next morning we’d find a piece of tail or some indescribable rodent part in the grass. I have never seen behavior like this in cats before or since. Golden Ball and Chocolate Drop aka Hobo. My 2nd grade teacher Mrs. Moore had a litter of 8 kittens, and advertised to our class the availability of as many free kittens as any of us wanted. Prior to this, my parents had responded to our incessant pet requests by allowing my sister and I one goldfish each. My sister and I treated this token move as a temporary placeholder, patiently plotting the next phase. After all, goldfish are incapable of the bonding a child expects from a pet. The goldfish didn’t greet us when we came home from school, didn’t come when called. The utter meaninglessness of our goldfish relationship had come to a head during that previous summer when Susan and I noticed suspicious changes in size and appearance of the two goldfish when we came back from vacation. Given our growing dissatisfaction with the goldfish status quo, Mrs. Moore’s litter of kittens could not have come at a better time. We picked out two: I got a black and white kitten which I named Chocolate Drop. Susan got a yellow tomcat which she named Goldenball. My cousins also got a kitten. I think all three of the cat’s names were taken from a vintage book about a child who gets some kittens and names them after the candy in a candy store – we had this book and it was apparently on the required reading list in our school. Goldenball – he had his moments, but was generally as I recall more high strung than his brother. I remember him zooming around the house, especially when we kids were being too loud, and knocking things over. Once he jumped up on my Mom’s table of potted plants and pulled down some plant, which toppled and thumped a nice mountain of dirt onto the carpet. By this time of course, Goldenball was in the other end of the house. The poor thing died – when I think I was in 3rd or 4th grade…still a fairly young cat. Some adults said it was “distemper” and others said he ate grass where someone had dumped antifreeze. Chocolate Drop had a longer life, he lived long enough in fact to get himself renamed “Hobo.” Sometime in the winter of his 2nd or 3rd year, he disappeared. I remember us calling and looking for him with no luck. 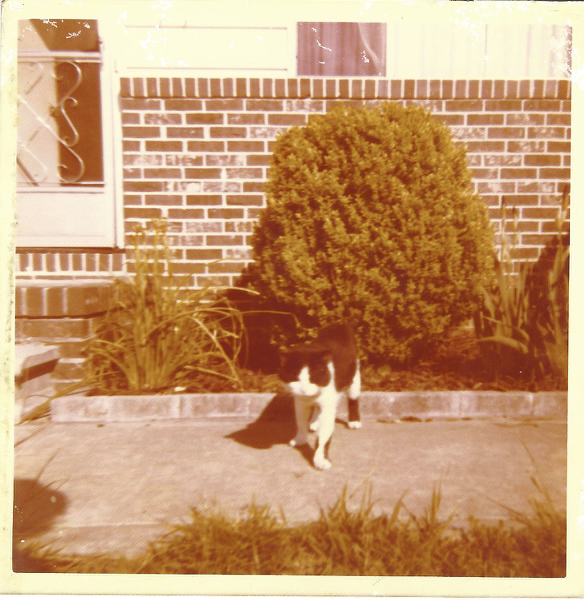 Then a few months later while out on our customary family walks around the neighborhood, we saw a cat that looked just like Chocolate Drop, lounging on the front porch of Mrs. Keller’s house. We asked about the cat, and she said he’d come to her house in the last winter and that she’d taken him in, fearing he’d freeze to death. She’d named him Hobo. My parent’s decided to not press the matter and we continued to say hi to Mrs. Keller and Hobo on our regular family walks. One day she came out onto the porch and called for us, and asked if we’d like to take Hobo. “He’s getting under my feet these days, and I’m afraid I’m going to fall and break my hip and that’s all I’d need.” She said. We discussed this together, my sister and I rooting for the return of the cat to its original owners. Mrs. Keller seemed anxious for the cat’s well being, and told us that he would only eat mackerel. This resulted in a fast trip to the nearest grocery store in search of mackerel, and grumblings of how expensive it was. Soon Hobo was being carried by my Dad down the street to our house. When we let him into the house he ran and hid under my bed. He stayed there for two days, and we slid saucers of milk and mackerel under the bed for him. After this, he came out and lived with us happily for another 3 years or so, until dying from an abscessed wound he received in a fight with Rascal, another tomcat who lived up the street. My Mom’s cats. 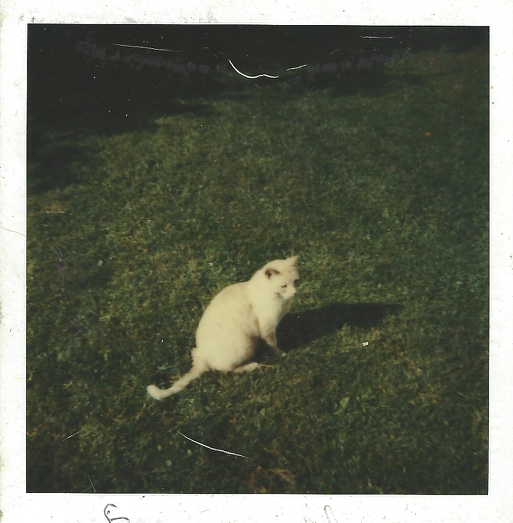 When my Mom was a little girl, growing up on a potato farm in northern Maine, they had a lot of barn cats. 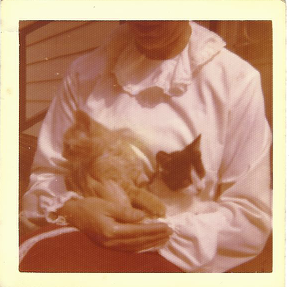 My Mom and her sister Helen apparently adopted a couple of the kittens as house cats. To this day they are nameless, but infamous. Whenever a bad summer storm passed through, the kittens would respond to the cracks of thunder by running up the living room curtains, all the way to the ceiling. Mom said that Grandma would come out of the kitchen and go after them with a broom. Were the precious little varmints really terrified, or was the thunder just a convenient excuse? That’s what I want to know. So here’s to the cats in your life and mine. The way they stretch and nap, the way they find the sunniest windows, the best perches, the softest pillows, makes me think that cats are here to remind us to take better care of ourselves.